If your windshield wipers start chattering or streaking, you may be able to clean and adjust them. However, once the rubber starts wearing out, your best bet is to replace them. You can purchase windshield wipers from any auto parts store and install them yourself – or you can bring your car in to Scott’s Fort Collins Auto and have new windshield wipers installed for free! Functional windshield wipers are an integral part of your car’s safety system. Since they’re made of rubber, wiper blades take a beating from the summer sun and winter snow. Chattering and streaking make it difficult to see the road, other cars, and various hazards while driving in the rain and snow. If your wipers ever get to this point, replace them immediately. To prevent the need for an urgent replacement, plan to install new blades every six to 12 months as part of your preventative maintenance schedule. Buy the right windshield wipers: Make sure you know your car’s make, model, and year before heading to the auto parts store to buy replacement windshield wipers. You may want to measure the length of your wipers as well. Don’t be alarmed if each blade is a different length – this is quite common. Tell a store clerk what you’re looking for, and he’ll help you locate the correct product. Prepare to replace the wiper blade: Rock the arm up and away from the windshield. It should reach a point where it stays in a lifted position without the need to hold it. Place a towel or other padding on the windshield to protect the glass in case the arm snaps back down while you’re replacing the blade. Remove the old wiper blade: Locate the plastic tab where the blade meets the arm. Press the tab in with your thumb while holding onto the blade with your other hand. Pull downward on the blade until it slides off the arm hook. Once free, pull the blade up and out to completely detach it. Examine the plastic tab on the new wiper blade: The replacement wiper may include multiple adapters to allow for compatibility with various types of cars. Identify which adapter has the right curvature to match the hook in the wiper arm. A little trial and error doesn’t hurt if you need to take a few guesses. Install the new wiper blade: Slide the curved side of the blade into the hook on the wiper arm. Gently push until it snaps into place. Remove the padding from the windshield and lower the wiper arm assembly onto the glass. 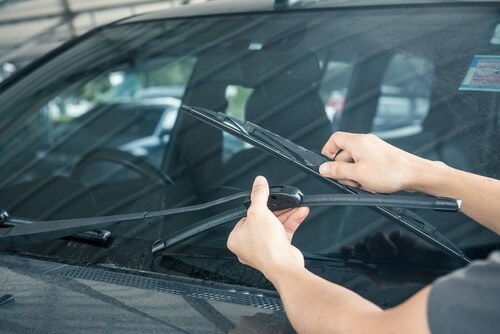 Repeat these steps with the second wiper: If everything looks and feels secure with the first wiper blade, install the second one following the same steps. You should always replace both wiper blades at the same time, even if only one is chattering or streaking when you decide to install new ones. Test the installation: Run the new windshield wipers a few times to make sure they travel smoothly over the glass. Then, you know you’re all set the next time it rains. We Install Windshield Wipers for Free! Don’t want to worry about performing the installation yourself? When you buy new windshield wipers from Scott’s Fort Collins Auto, we’ll install them for free! It’s our way of saying thank you for choosing us as your automotive specialists in Northern Colorado. The next time you need an oil change, tune-up, or other automotive services, come to Scott’s, and we’ll replace your windshield wipers, too. Schedule an appointment or call us at (970) 682-4202 to let us know when you’d like to stop by.